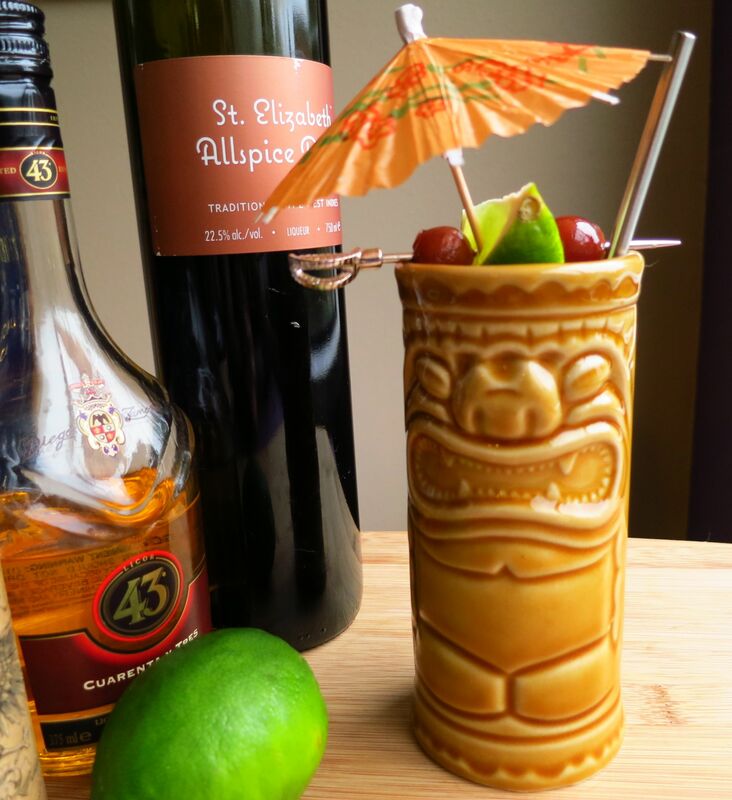 It’s spring in Seattle, which means it’s tiki time! The weather’s a bit dull, grey and rainy right now, so we’re turning to delicious tropical drinks to lighten our spirits. Come with us to the South Pacific 🙂 Read on to dream of warm sunny beaches and palm trees. First up we have the Cargo Cult. We recently received a bottle of Licor 43. (See our samples policy for what that means.). We felt that its strong, true vanilla notes would make a nice addition to a tiki drink. We started by pairing it with okolehao (a Hawaiian rum made out of ti root), which was nice. Then Christa asked what would be a good substitute if people don’t have okolehao, since it isn’t that common. It’s strong, a little sweet, and a little funky, so we thought Smith & Cross Jamaican rum? Turns out that was a better pairing yet, so we started with that. Since we were aiming for tiki, we then tried different combinations of tropical fruits, including guava, passion fruit, coconut, etc. After a lot of tasting, we settled on a combination of guava and coconut. Tasty, but it needed a bit of acid to balance things out, so we added some lime juice. Better, but still not perfect. So we added some Boker’s bitters which we recently acquired from Canon (thanks, Jamie!). Better yet, but still not there. Finally, we added a dash of allspice dram and that was the ticket to bring this drink together. Shake with ice. Strain into a glass. Garnish with a lime wedge and a cherry. Palate: Really nice, rich mouth feel between the coconut and Licor 43. Sweet guava, lime peel and rum funkiness on the intro. Acidic lime plus intense vanilla and creamy coconut on the mid-palate. Woody/funky rum and smoky molasses on the end. Guava on the tail end of the finish and into the after taste for Shaun. Next up with have the Flat Earth. 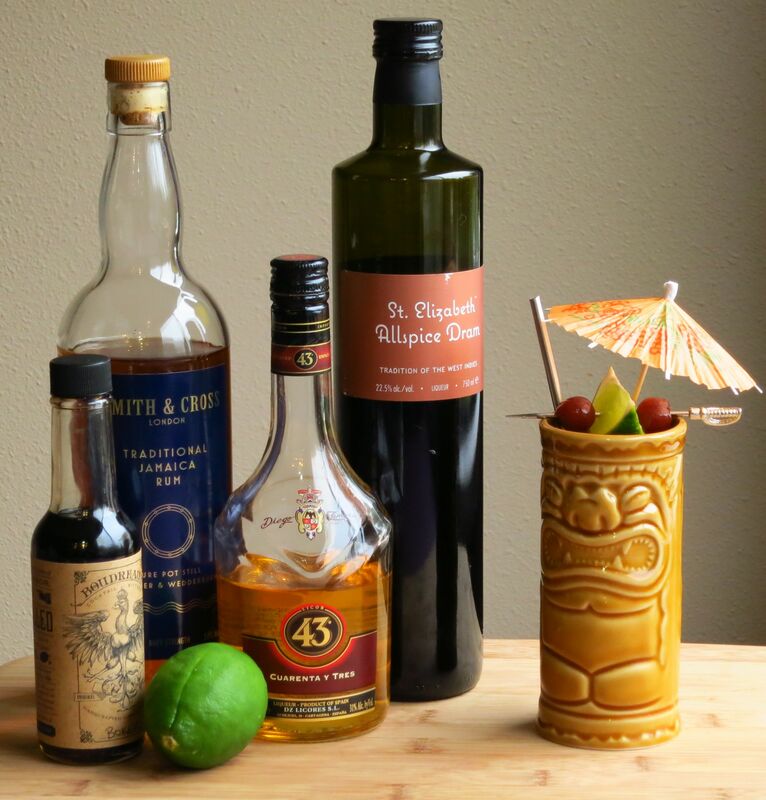 Christa’s been wanting to try and do a Scotch tiki drink for a while. When do you ever see that? 🙂 So we decided to experiment with it. We tried a number of scotches in the bar combined with some basic tiki ingredients (citrus, falernum, orgeat, mint), and went with a less smokey, peaty scotch since it played better in that sort of mix. Then we started to assemble a drink. The orgeat was a fail with all of the scotches, so we tried falernum instead. Win! It still needed livening up, so we added a bit of lemon juice and a bit of mint. Good, but it still needed something. Since we’re also making orgeat at the moment, we thought of orange blossom water and added just a touch. Perfect 🙂 Double win! Muddle mint in the shaker, then add the other ingredients. Mix all ingredients and pour into a glass of crushed ice. Garnish with a sprig of mint and an orange wheel. Nose: Orange, orange blossom, hints of barrel wood and mint. Some spiciness from the falernum with some lime and ginger. Palate: Orange blossom and sweet caramel-y oak from the scotch to start, underpinned by a bit of peat and smoke. Lemon , mint, plus lime and spice from the falernum on the mid-palate. Orange blossom & clove on the finish. 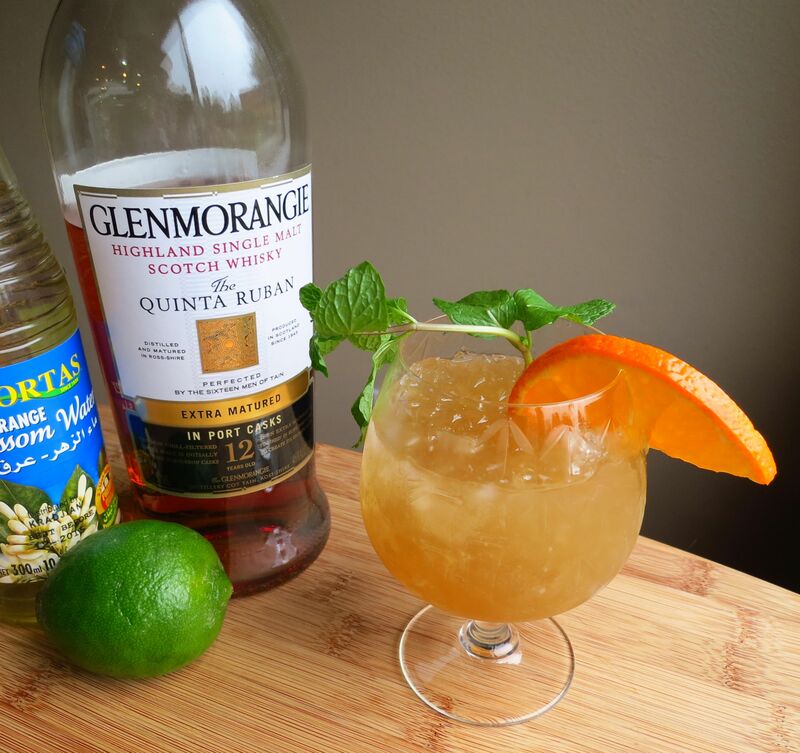 This entry was posted in allspice dram, guava puree, jamaican rum, licor 43, scotch and tagged cargo cult cocktail recipe, flat earth cocktail recipe, glenmorangie scotch, smith and cross jamaican rum. Bookmark the permalink.